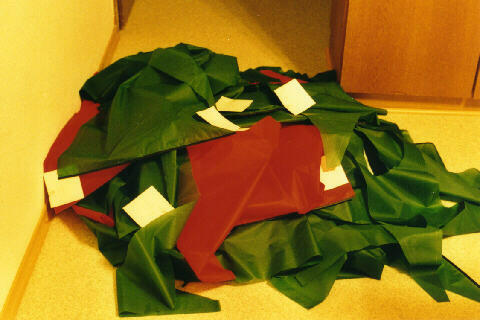 A lot of prepared fabric. You see the piece of paper with the name of the part to identify the part in an easy way. This sketch shows the ways, how to sew pieces together. The first one shows the first seam. The second one is only useful with coated or hotcutted fabric. The third one gives the best protection for the edges of the fabric. This photo shows how to make a fixing point for the bridle line on the lower tip of the keels with edge seam tape. First you sew the trailing edge of the keel. 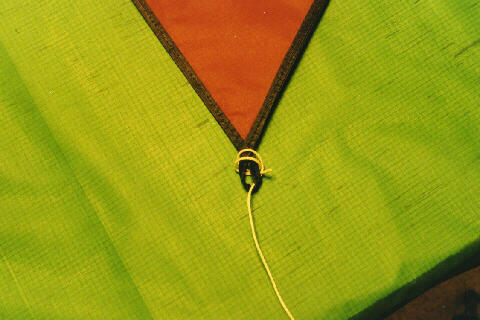 Than sew the leading edge from top point to the lower point. Continue sewing the edge seam tape for about 20cm (8 inch). 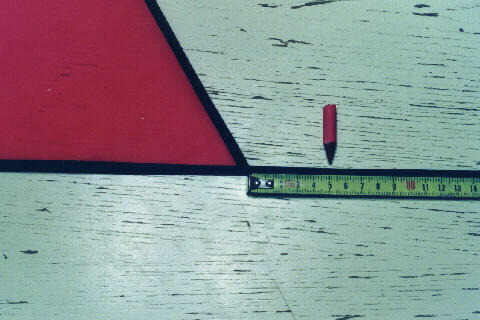 Mark the tape at 5cm (2 inch) from the keel tip. 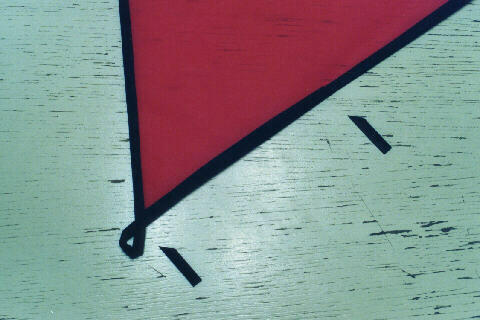 Fold the tape for a loop and place the mark on the keel tip. Sew the rest of the tape on the trailing edge of the keel. This sketch shows the best way to sew the pieces together. Take care about place and direction of the pieces, because sometimes you have to sew 4 pieces together. 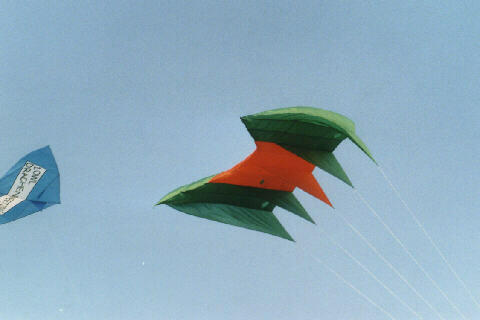 This is an example how to close the trailing edge. Between the profiles P4 (the thick line in the sketch) you can use edge seam tape. Than you make a larger seam allowence between P1 and P4 (5cm, 2 inch). Make the first seam to close the trailing edge directly between the ends of profile P4 to the end of profile P1. 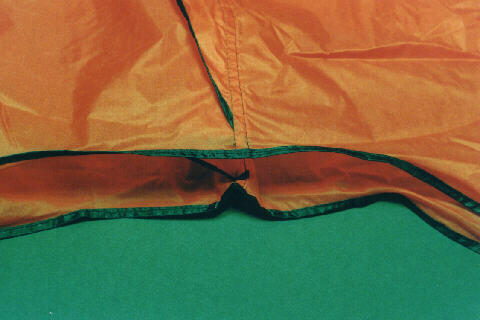 Fold the seam allowence twice towards the top surface and make the second seam (again from P4 towards P1). 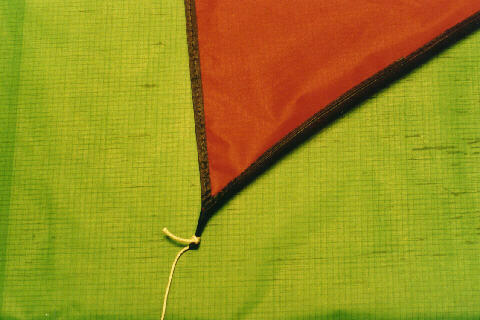 Before reaching the end of P1 you can add folded edge seam tapes to make fixing points for a drogue. At the end of profile P5 leave the top and bottom surface a bit longer to realize the edge binding of the surfaces. In this way I made the loops for the bridle line to fix to the lower bridle point or for the flying line to fix on a help line on the lower bridle point. 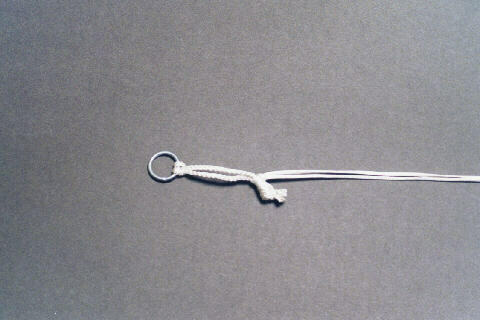 This knot I used to fix the loops of the bridle lines to the lower bridle point. 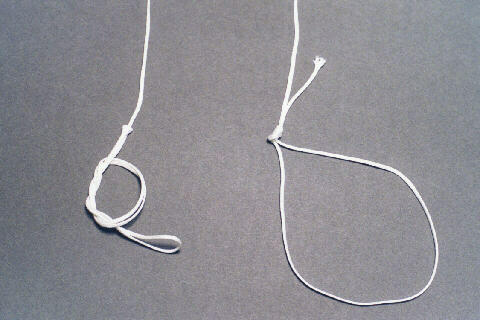 The second turn of that knot fixes the knot more safe. That is the complete bridle at the lower bridle point with another loop to fix the flying line. With the marks on the lines it is easier to select the right lines when tying the lines to the loops on the lower keel tips. This is the way, how I fixed the bridle line to the loop on the lower keel tip. 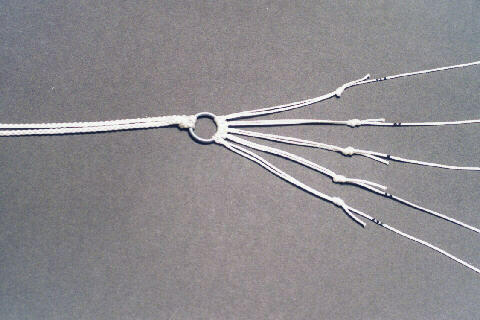 Now, the knots on the lower keel tips are fixed with the right length of the bridle line. 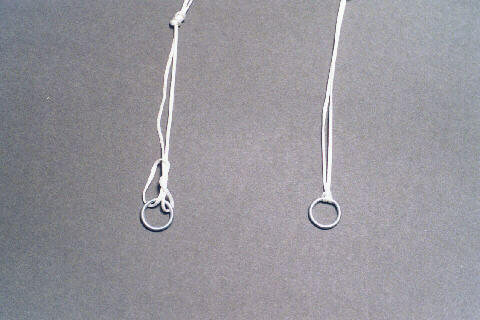 That is my way to fix the flying line to the additional loop on the lower bridle point.The loop of the flying line is fixed behind the knot of the additional loop. 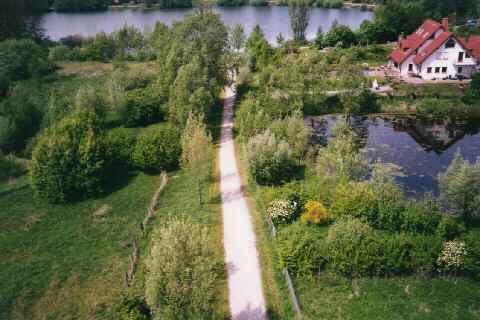 Another view during maiden flight towards the trailing edge. 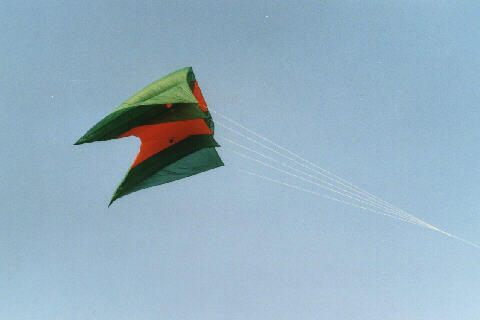 On may 13, 2001 I used this kite first time for kite aerial photography.